DMK-900 series 1U rack mount KVM console. Dual slide rail monitor keyboard rack console. Built-in 8- and 16-port KVM switch come in PS/2 interface only or dual interface that provides both PS2 and USB connectivity. The dual rail DMK-900 series represents an intelligent use of rack space. 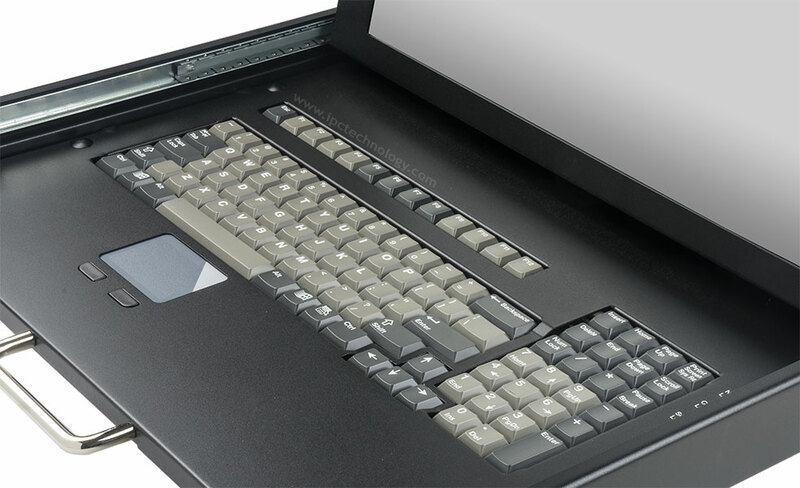 Essentially, two sets of slide rails are attached to the LCD and keyboard allowing each component to slide in and out of the rack independent of the other. With this approach, the operator can hide the keyboard while still allow the LCD to remain displayed. It also gives an additional level of server management security by having the keyboard hidden to prevent unauthorized access. 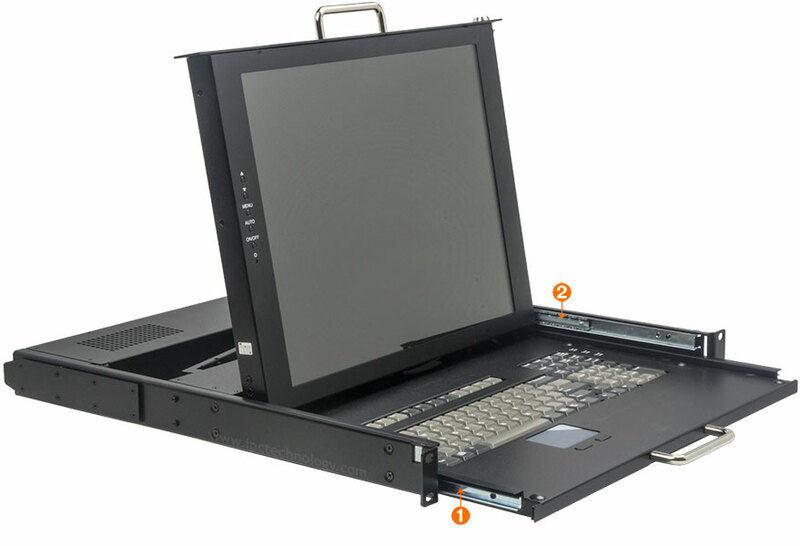 DMK-920S17P is a single KVM port, PS/2 interface rack console. 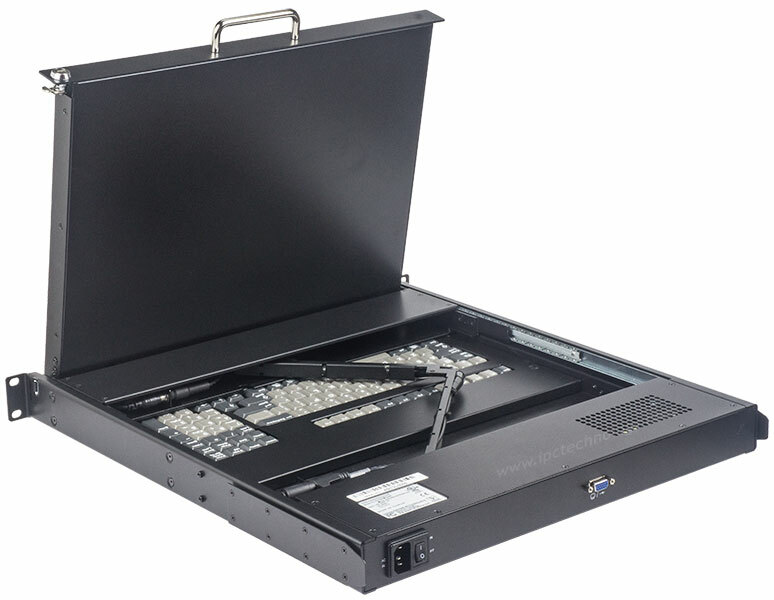 DMK-920S17U is a single KVM port, USB interface rack console. DMK-980S17P comes with a 8-port KVM switch and supports PS/2 keyboard/mouse. DMK-980S17D comes with a dual interface 8-port KVM switch which supports both PS/2 and USB. DMK-990S17D comes with a dual interface 16-port KVM switch which supports both PS/2 and USB. The DMK-900 series KVM port use a DB-15 connector carrying both analog video and keyboard/mouse data. Built-in 8- and 16-port KVM switch come in PS/2 interface only or dual interface that provides both PS2 and USB connectivity. 1. Single port USB or PS/2 interface (DMK-920S17P, DMK-920S17U). 2. 8-port PS/2 interface (DMK-980S17P). 3. 8-port dual interface (DMK-980S17D). 4. 16-port dual interface (DMK-990S17D). KVM cables are included with the product. With our dual interface models, you may choose to have all USB, all PS/2 of a mix of the two types of KVM cables. 19-inch rack mount 1U slide-out drawer with LCD monitor, keyboard and touchpad mouse. 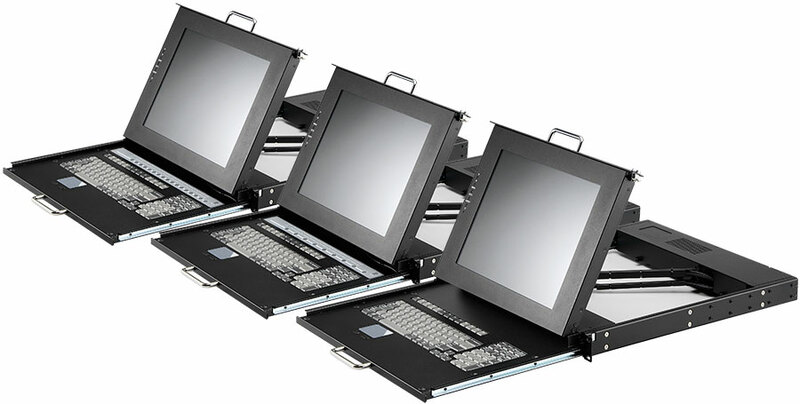 Two sets of slide rails for panel and keyboard enables independent extraction of each component..
Panel: 17-inch, 5:4 aspect ratio LCD (measured diagonally), 1280 x 1024 pixels. Color Depth: 16.2 million colors ( RGB 8-bit ). View Angles (degrees): 170/160 (Horizontal/Vertical). Backlight MTBF: 50,000 hours at 25±5°C. 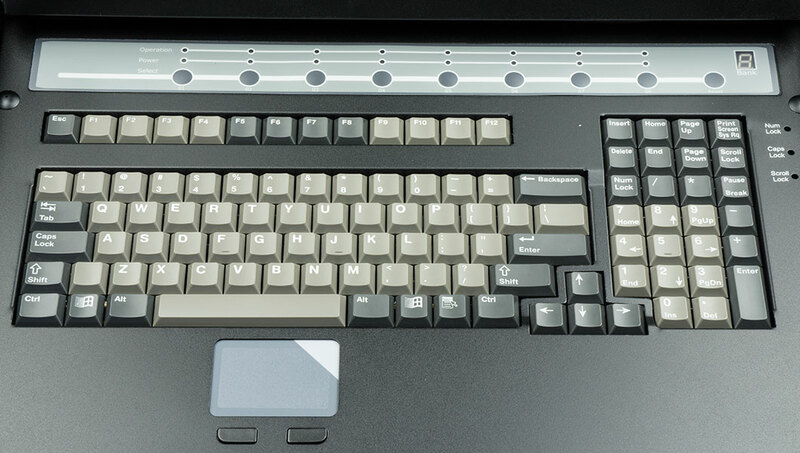 Keyboard: Full size, 105-key, 12 function keys, 17-key numeric keypad. Pointing Device: Two-button touchpad input device. Keyboard/mouse Interface: PS/2 or USB interface only. Or dual interface support that provides both PS2 and USB connectivity. KVM external interface: Each KVM port interfaces to attached computer via a D-Sub 15-pin connector. USB model KVM cable: 6-feet KVM cable with D-Sub 15-pin connector to KVM switch, VGA and USB connectors interfacing to computer. PS/2 model KVM cable: 6-feet KVM cable with D-Sub 15-pin connector to KVM switch, VGA and PS/2 connectors interfacing to computer. DMK-920S17P, DMK-920S17U dimensions/weight/minimum flange to flange distance: 19" (W) x 1.75" (H) x 19.69" (D) / 26 lbs / 21.25". DMK-980S17P, DMK-980S17D dimensions/weight/minimum flange to flange distance: 19" (W) x 1.75" (H) x 23.62" (D) / 30 lbs / 24.87". DMK-990S17D dimensions/weight/minimum flange to flange distance: 19" (W) x 1.75" (H) x 23.62" (D) / 32 lbs / 24.87". Note: Depth of drawer excludes drawer handle which adds 1.25" to the depth of the products. Input: Autosensing 60W, 100-240VAC, 50/60Hz AC power supply. Operating temperature: 32 ~ 122°F. Dual rail design features two sets of ball bearing slide rails: (1) keyboard slide rail, (2) monitor slide rial. DMK-980S17 8-port KVM switch port selector buttons and status LEDs. DMK-920S17U back side view with keyboard stored away. Download DMK-900 series user guide ↓. Download DMK-900 series datasheet ↓. Download DMK-920 series mechanical drawings ↓. Download DMK-980 series mechanical drawings ↓. Download DMK-990 series mechanical drawings ↓. Use this form to request a quotation for the DMK-900 series. DMK-920S17P (PS/2 interface single KVM port). DMK-920S17U (USB interface single KVM port). 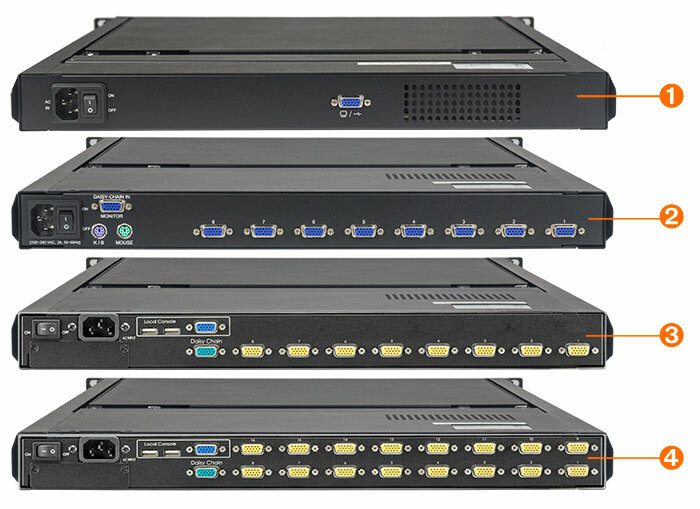 DMK-980S17P (PS/2 interface 8-port KVM switch). DMK-980S17D (dual-interface 8-port KVM switch for USB and PS/2 interface). DMK-990S17D (dual-interface 16-port KVM switch for USB and PS/2 interface). PS/2 KVM cable has a VGA and two PS/2 connectors. USB KVM cable has a VGA and USB connector. If you select a dual-interface model please use the message field to tell us the type of KVM cables you'll need. They can be all USB, all PS/2 or a mix of the two types. One Two Three Four Five I need more than five...see message. Purchase Orders—We accept academic, research institution, local, state and federal government agencies, and corporate purchase orders. Standard terms is net 30.
Credit Cards—We accept payment with credit cards. Please call (626)487-7034 to order. Visa, Mastercard, American Express are accepted. We do not accept international credit cards at this time. However, if you reside outside of the United States and Canada, you can email us your purchasing and shipping requirements. We'll prepare a proforma invoice as acknowledgement. Resale discounts are available. Please send your request using the Request Price Quotation form. To qualify for reseller discount, a resale certificate/permit/ID is required. The DMK series are no longer stocked. They are available only by special order. © 2009 Contemporary MicroSystems. All rights reserved. Product Information and Site Content are subject to change without notice.